Definitely breathless at the summit. The descent from Mt. 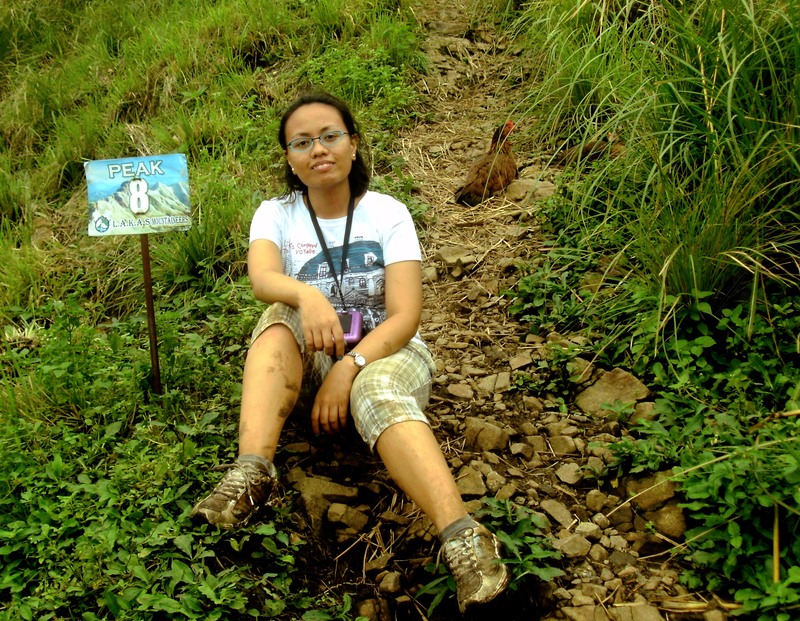 Pulag was definitely full of pride for me. The congratulatory remarks from the people who were just embarking the climb were just music to my ears that day. And Breathless never gave me trouble again after we both enjoyed the summit experience. When we reached Camp 1 again on our way down, I added another layer of clothing from the existing two layers. Our group came to a consensus that it was colder there at the moment, compared from our ascent the previous day. And so we bade everyone there loads and loads of luck (with an underlying meaning of “beware of the cold”) as we continued our descent. 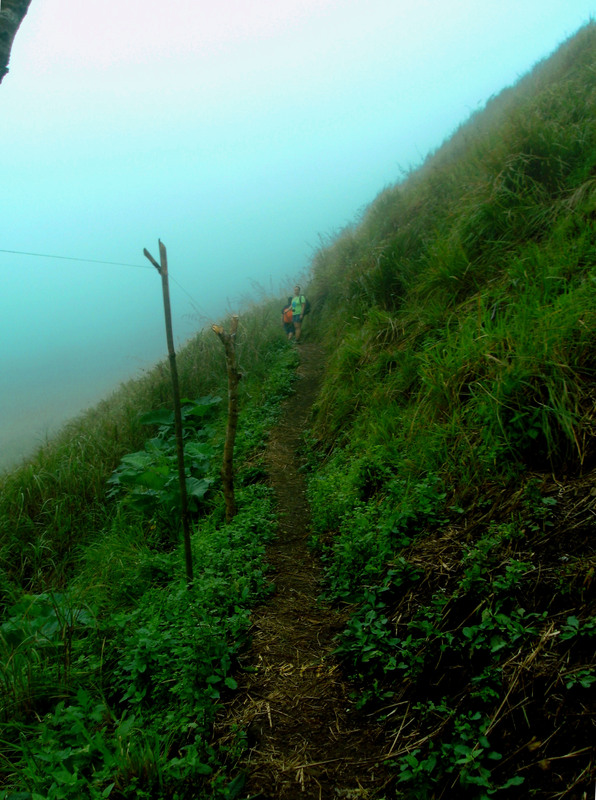 When we reached the ranger station, I was overwhelmed by the number of hikers seeking the sea of clouds. This was the ranger station when we started our climb around 2PM on a Friday. When we went down on a Saturday afternoon, the place was filled with hikers. Photo by Karah Decapia. After munching on some fresh snacks from the food stalls, Kuya Fermin, our jeepney driver, finally arrived. Nessa and Kuya Fermin. In case you need his services, you may contact him at 09474545044. Photo by Karah Decapia. And this was when fatigue finally swept everyone to sleep. Photos by Karah Decapia and yours truly. When we all woke up, Kuya Fermin brought us here. The Ambuklao Dam. Photo by Tim Reyes. Ambuklao Dam is one of the major water reservoirs and hydroelectric power source in Bokod. 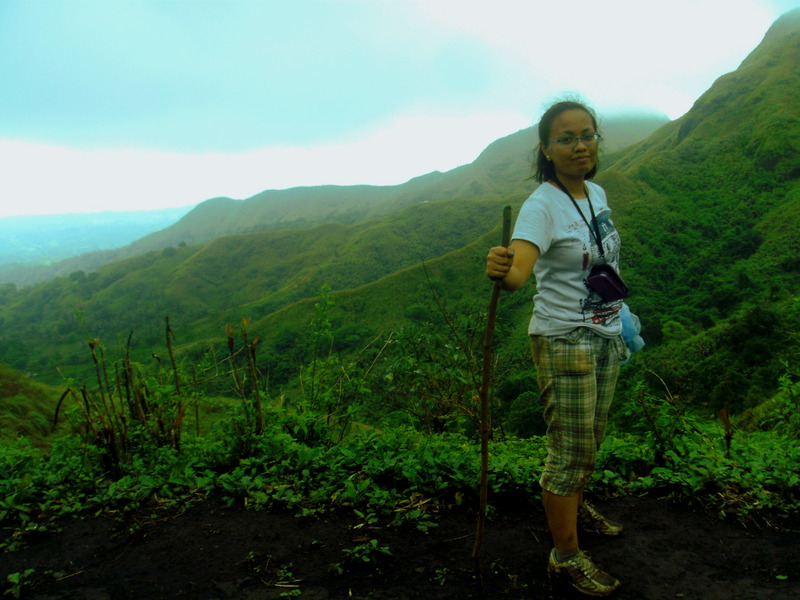 And it sure was another source of breathtaking landscapes from the beautiful province of Benguet. Benguet. Still leaving us breathless. And after another hour of zigzag roads, we finally and treated ourselves to a sumptous feast at the famous 50s Diner located at General Luna Road corner Brent Road, Baguio City. And this was where we parted ways. Karah, Tim, Ralph and me decided to stay in Baguio for one more night while the rest of the group headed back to Manila. We managed to find an affordable inn along Session Road, and no, we didn’t take our rest yet. Instead, we had coffee at Volante. Their apple pie was highly recommended and their Volante coffee truly was so strong that I worried if the weariness from this very long day could send me to sleep that night. But eventually, it did. With the help of the soft bed and blankets, fatigue became more powerful now than the cold. But the low temperature still stayed at the side of our beds that night. The next morning, we checked out of the hotel and were suddenly in the mood for art. To get to the Oh My Gulay Artists’ Cafe, we did a post-climb exercise as we ascended five flights of stairs inside the La Azotea Building along Session Road. And through the works of passion and the relaxing ambience, OMG could truly extract the inner artiste out of each guest. The healthy menu and good coffee were even the best companions to keep those brain cells oozing with creativity. After our organic banquet, we planned to go to a cultural village but Ralph had an emergency and needed to get to Manila the soonest possible time. So Karah, Tim and I grabbed a cab to Pinsao Proper, Baguio City while Ralph offered to secure three more bus tickets for our trip back that night. Tam-awan Village shares a glimpse of the Cordilleran heritage from the arts to its customs and traditions. Inside the Bugnay Gallery. Photo by Karah Decapia. 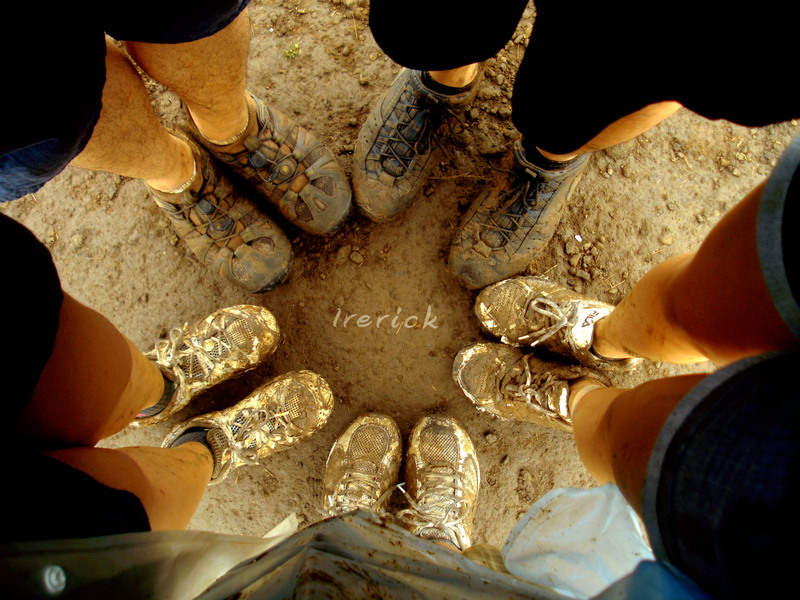 And what I liked best about the place was that it provided us another post-climb routine after the Pulag trip. But while we were enjoying our mini-Pulag adventure, Ralph called to tell us that all tickets bound for Manila were already sold out. The next available trip would be at 1:00AM the following morning so he would take his luck through the long queue of chance passengers. So we bade the anitos goodbye so we could already secure our tickets. But along the way, we saw the market. The vegetables and coffee were too enticing so we got to them first before the tickets. Gulay. Photo by Tim Reyes. So when we finally got hold of our tickets, they were already for the 2:30AM trip! And it was still four o’clock in the afternoon. I never had so much time to spare! So we decided to roam around a little more, until we found this place. The climb continued at Casa Vallejo, Upper Session Road. The shop had all the stuff one needed for mountain-climbing: walking sticks, trek pants, backpacks, water jugs, harnesses, stoves, etc. But after feasting our eyes on yet another post-climb experience, we still had a lot of time on our hands. So we just continued walking along Upper Session Road and saw this. No, we were not interested to have a massage and spa. What caught my attention was the Cinematheque. Unfortunately, the last film for the day just finished. So instead of films, we went to visit the books. And the Pulag hangover remained. Tim and Karah browsing “Akyat!” by Romy Garduce. The place was just relaxing and features a wide variety of books. Soon it was dark and our stomachs started to get grumpy. Their pizza and pasta definitely relaxed our grumpy stomachs. We finished dinner at around eight o’ clock. How many more hours do we have before 2:30AM? We decided to walk around some more, though the cold was starting to get to my nerves again. Along Session Road, we found a booksale shop. The placed offered books from fairytales to biographies. They even have a section offering 50% discount for all the books. So we tried our luck. Most of the books in the section might seem obsolete but I was able to unearth a valuable piece of non-fiction there. It was 10:30PM when we left the shop. How many more hours do we have before 2:30AM? Across the street, the Night Market along Harisson Street greeted us a chilled welcome. And that was an ukay-ukay haven. All sorts of second-hand and brand new items could be found around the area: from clothes to shoes to kitchen utensils. We finished our window shopping at around 11:30PM. We decided to spend the rest of the time at the terminal where we witnessed how many passengers were taking their chances. The queue was still long even until past midnight. I started reading my book and never thought I would get so teary-eyed just on the first few pages of this compilation of true-to-life stories about death. And I continued crying as the temperature went lower and lower. At long last, the clock struck 2:30. We boarded our bus and said goodbye to the chance passengers who seemed to be witnessing sunrise at the terminal. 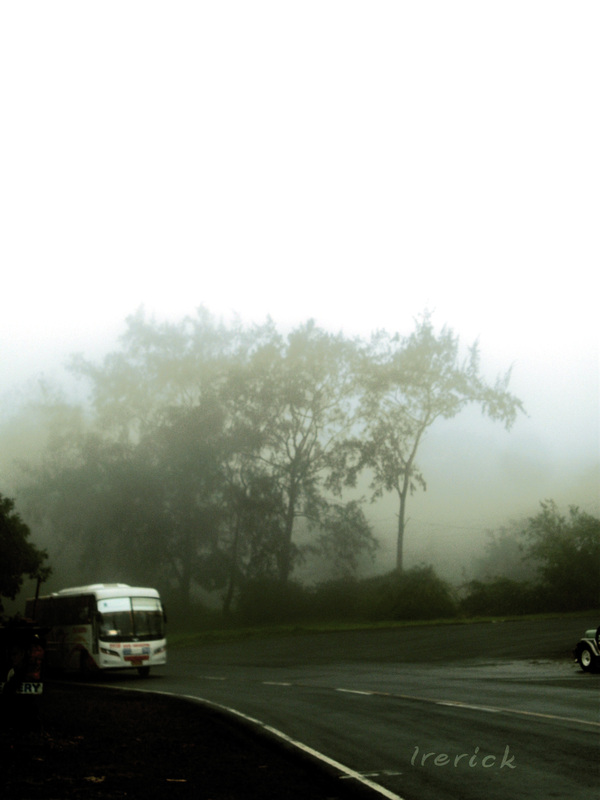 And as we went further and further from Baguio, the temperature started to normalize. We now reached Central Luzon as the sun wished us a very good morning. The descent was now complete. We were born together. We even grew up together. And he had always left me breathless ever since. He was the chill and quiet type. But he was also very moody at times. This childhood friend of mine was strict with my engagements with outdoor activities. He said that he should be the only one to leave me breathless. He became too possessive and was fierce whenever I tried to sneak out. One could hear his wrath beneath my chest. It was a special tune, resembling a mad bird, that reverberated through my whole respiratory system. And it was definitely a sound only he could make. His Filipino name was Hika. His english name was Asthma. But I would like to call him “Breathless”. And maybe Breathless was also the main reason why I was so vulnerable to cold climate. And we were talking about cold temperature in the Philippines here, Central Luzon and National Capital Region to be exact. We did not have winter but my feet was already turning purple every December to January because of the cold mornings. So when my friend Karah initiated a Mt. Pulag climb during the peak of the cold season in the country, I was determined to use the month-long pre-climb period to train and accustom my lungs to the cold. Mt. Pulag, the third highest peak in the Philippines, was located in the province of Benguet, an area known for its mountain ranges and cold climate. So the sloping streets of RP Gulod, Novaliches became my training ground twice or thrice a week. I tried to do it every early morning but work just did not permit. And yes, I needed to do it early morning to catch the cold. It was a Friday morning, around one o’clock, when I and my friends left Manila via Dagupan Bus bound for Baguio. I had two layers of clothing at the moment. 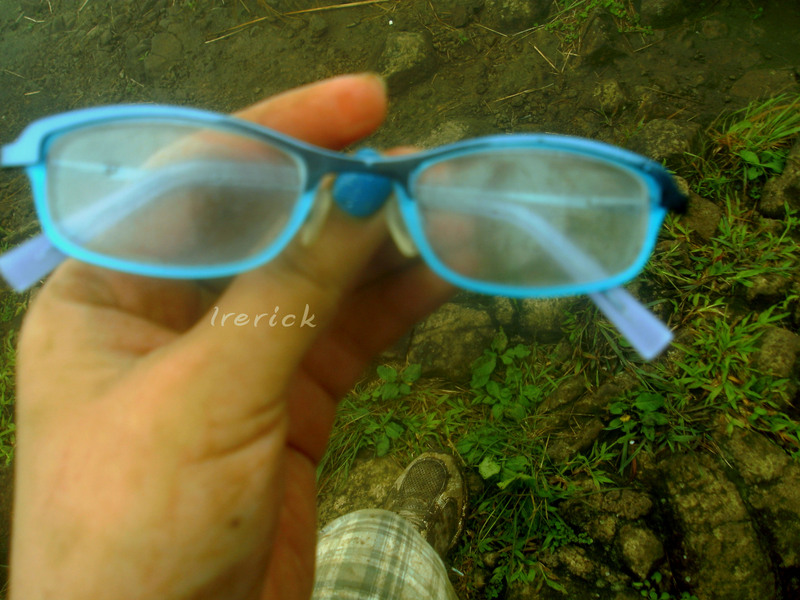 At three o’clock, we were around Tarlac area and the cold started to creep inside my lungs. I added one more layer to my clothing, a total of three layers. Our bus surprisingly arrived at Baguio City at around 5:30 in the morning. And I was really overwhelmed by the cold. I added another layer of clothing, a total of four layers. So if I take my Masters this year, would I graduate on time? I just had a photo with UP Baguio’s Oblation! 🙂 Photo by Karah Decapia. We had our breakfast at a local fast food chain and went to the University of the Philippines (UP) Baguio campus to meet our reliable service vehicle. Because the blur was an effect of the 4D, haha 🙂 Photo by Ralph Ubales. We left UP Baguio at around nine o’clock in the morning. And there started our three-hour 4D theatre viewing of soothing sceneries from our mechanical screens on both sides of the jeepney. The seats were also specially made so you can realistically feel all the bumps and curves of the zigzag roads of Benguet. The heat of the sun through the window could also be realistically felt that I needed to remove two layers of clothing. I had two layers left at the moment. 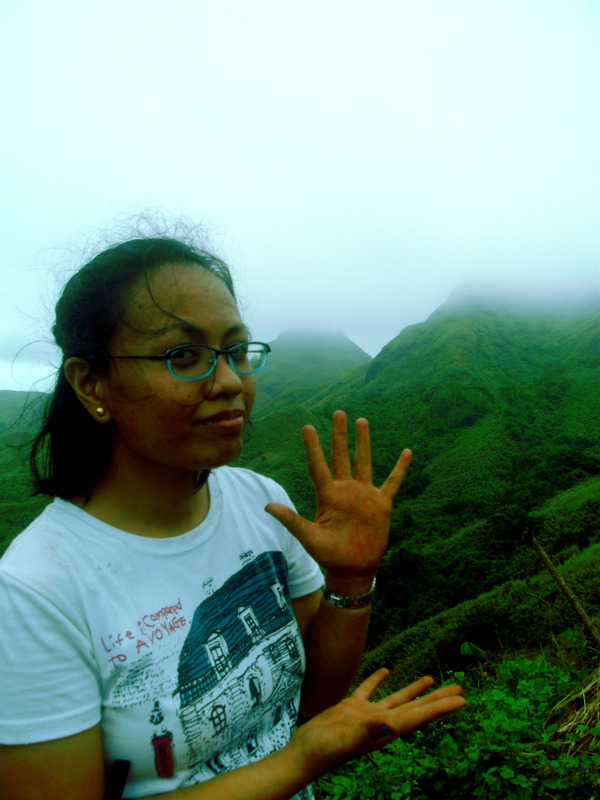 A baby girl and her mother joined us in our jeepney ride towards the mountains. After eating lunch at a nearby carinderia, we went to register and hear some short reminders from the Department of Environment and Natural Resources (DENR) office. A short seminar for those seeking Mt. Pulag. 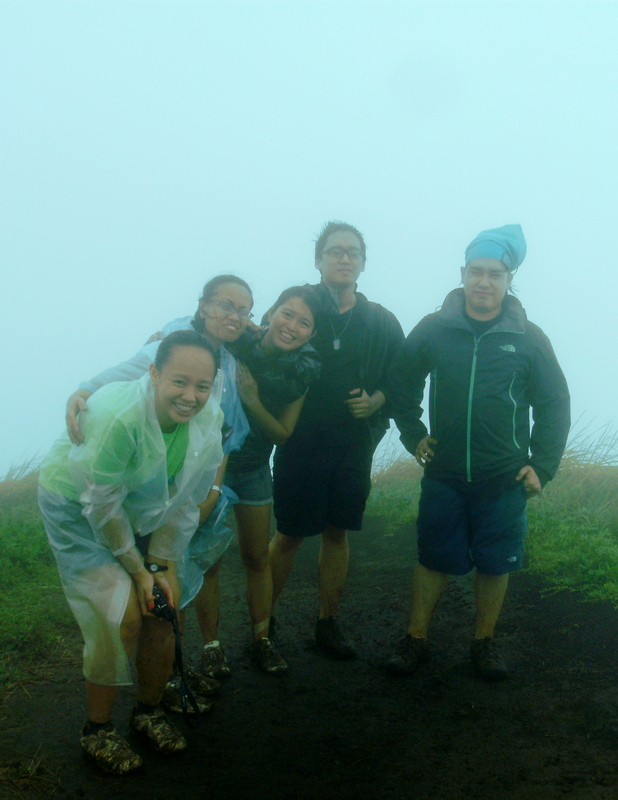 Then another hour of sceneries welcomed us as we finally reached the ranger station at the the foot of Mt. Pulag, where we met our tour guide, Kuya Tiryo. I added one layer to my clothing, for a total of three layers. Another view from the mechanical screen of the 4D jeepney. We started our trek at two o’clock in the afternoon. And I just took my first few steps when I began to hear the whistling rage of Breathless inside my chest. Uh-oh, not this early please. But when I turned to my right, I saw why Breathless was enraged. My Breathless surely was jealous of the sceneries that would definitely take one’s breath away. And so with each step, this asthma got worse. I needed to use my brown bag as an improvised air mask. Breathless, please let me reach the summit. Photo by Karah Decapia. And yet another reason for being breathless. Thank God that after forty-five minutes, Breathless was able to adapt to the altitude and the thinness of the air around. And I felt like I needed to keep going to keep my breathing momentum aligned with the climate. At 3:45 in the afternoon, we reached Camp 1 where we rested in a small shed. But it seemed that the altitude was even higher here because Breathless started whistling again. I even added another layer of clothing, a total of four layers now. Kuya Mil at Camp 1. Rest. Photo by Nessa Gabrillo. After around thirty-five minutes, Breathless stabilized itself again. I thought it was a good thing that the intervals became shorter. I prayed that my breathing continue to calm down. And my prayers were answered as the wrath of Breathless finally subsided when we reached Camp 2 and prepared for the night. Setting-up. Photo by Jed Lising. Outfits of the Day. Photo by Nessa Gabrillo. Pasta al dente on top of Mt. Pulag. Yum! Photo by Nessa Gabrillo. The cold of the night was really getting to my nerves. I now had six layers of clothing, gloves, two pairs of socks, a scarf and a bonnet on but I still could not feel any warmth. And the strong rush of the wind was not helping at all. And then dinner ended and I and my friend Nessa were the ones assigned to do the dishes. I never thought that the water could literally burn my hands because of its frostiness. And as the time went by, I could no longer feel my hands. My knees started to tremble and my jaw began to shake. So we did the dishes fast and finally zipped up our tents. But even the hands of the clock were frozen that night. The hours seemed to pass by so slow and the fatigue from the ascent was not enough to send us all to slumber. Even the sleeping bag, human warmth and the tent could not keep us safe from the cold. I definitely would not be fit for winter. The only good thing about this abnormal temperature was it sent Breathless to sleep that night. And I was thankful for that. Battling the cold would have been more torture if Breathless came to make a scene that night. Soon, it was three o’clock in the morning. It took us almost an hour to prepare and have coffee because our little butane stove was no match to the chill of the atmosphere. Even inside the tent, the water couldn’t heat up that fast. Photo by Nessa Gabrillo. Then I made a makeshift poncho from my blanket and put my rain coat over it for extra warmth as we started the one hour trek towards the summit. I now had a total of eight layers of warming material around me, but it was still cold, gah. But I thanked the Lord that Breathless was still at dreamland at the moment. And this was what kissed us a very awesome morning when we reached the peak at around five o’clock. And yes, Breathless never bothered me at all while we were at the summit. Maybe because he realized that he could not compete with what we discovered at the summit. So who wouldn’t lose their breaths from this sea of clouds? Even the view from the other side surely was breath-taking! Braving the cold was definitely worth it! And I was thankful for having really good shots here because the cold was making my hands tremble, I thought all my photos could have been defocused. And after experiencing these magnificent God’s creations for three hours, we trekked back to camp. Photo by Karah de Capia. This trip was a milestone for me because, first, Breathless never bothered me for the rest of the descent and I want to congratulate my lungs and my whole respiratory system for braving the cold. Secondly, my mountain-climbing skills and stamina had now improved because I was not the one at the end of the trek line anymore. I wasn’t the slowest hiker in the group now. I was even next in line with my friends, Karah and Tim, who were the master trekkers in the group. And this was just an achievement for me. Congratulations, self! Peak 1 = Mabilis ang mga pangyayari. Linggo ng umaga, Agosto 26, nang maalala kong nagyaya ang kaibigan kong si Karah na umakyat ng bundok sa petsang ito. Nagtaka ako na wala man lang akong natatanggap na kahit isang text message mula sa kanya o sa iba pang kaibigan na sasama dapat sa pag-akyat. So ano, tuloy pa ba? Naisip kong magpadala na ng mensahe, “Karah, akala ko aakyat?” Inakala kong ang isasagot niya ay ‘huwag muna ngayon’ o ‘saka na’ o ‘ay nakalimutan ko’. Nguni’t sa sobrang bilis ng mga pangyayari, natagpuan ko na lamang ang sarili ko sa isang establisyimento sa Quezon Avenue, mga alas-kwatro ng madaling-araw kinabukasan. Peak 2 = Sarado ang Mcdo Quezon Ave.
Napagpasyahan namin ni Karah, kasama ang lima pa sa aming mga kaibigan na tumuloy sa pag-akyat at magkita sa Mcdo Quezon Ave bandang alas-kwatro ng umaga ng Agosto 27, Lunes. ‘Pag baba ko ng bus galing Novaliches, nagulat ako na sarado ang Mcdo sa may Quezon Avenue Station ng MRT. “Cleaning” ang nakapaskil sa kanilang salamin na pinto. Sa tanang pagpunta ko dito tuwing madaling-araw, bilang madalas dito ang meeting place ng mga pull-out ng mga shoot, ngayon ko lang nakitang sarado sila para maglinis. Weird. So ano, tuloy pa ba? Kaya sa halip tumambay ako sa 7Eleven. Dumating ang aking mga kaibigan, may dalawang hindi na makakasama, at kami’y sumakay na ng bus patungong Nasugbu, Batangas. Sa aming pagbaba sa bus, ito ang tumambad sa amin. Nasa highway pa lamang kami, malayo pa sa mismong paanan ng bundok, ay sinalubong na kami ng hamog. So ano, tuloy pa ba? “Oo, mamaya wala na ‘yan, maaga pa kasi,” ang sambit ng isa sa amin. Dumating kami sa Evercrest Golf Course mag-aalas-siyete ng umaga. Sumakay kami ng tricycle at ibinaba kami ni Manong Drayber sa isang maputik na daan. “Maputik po talaga kasi umulan pero safe naman pong umakyat.” Ito ang mga salitang iniwan sa amin ng tricycle driver matapos naming maibigay ang aming mga pamasahe. Putik sa pataas na daan. Nadulas ang kaibigan kong si Jenny. Putik sa pababang daan. Ako naman ang dumulas. Putik na may mga bato. Ngumanga na ang sapatos ni Jenny. Putik na tumigas na. Napaupo naman ako. Putik na tila kumunoy. Lumubog ang sapatos ni Jenny at sa kanyang paghugot nito ay natanggalan na ito ng suwelas. Putik na halos hinulmang parang hagdan. Kinailangan ko nang pumulot ng tungkod sa paligid. Putik na bilug-bilog na… teka, putik pa ba ‘to? O kulay putik na lang? Marami pa namang kabayo sa paligid. Noong umalis ako ng bahay, kulay puti ang sapatos ko. Matapos sumuong sa Mud Pie Festival ng Nasugbu, Batangas, ganito na ang itsura ng aming mga sapatos. So ano tuloy pa ba? “Kaya ‘yan! Huwag lang uulan!” ang sabi naman ng kaibigan kong si Tim. Sa aming pakikipagbuno sa malambot na putik, bahagyang nakasilip ang sikat ng araw mula sa makapal na hamog. Nagdiwang ako, “Ayan na ang sun! I love you Sun!” Nguni’t tila masamang nababati ang araw sa Nasugbu dahil maya-maya lamang ay bumuhos ang ulan. “Hindi hihinto ‘yan. Matagal pa ‘yan,” ang sabi ng aming trek guide na si Kuya Gerry. So ano tuloy pa ba? “Tara! Malayo na tayo para bumalik pa,” ang aming napagdesisyunan habang isinusuot ang aming mga kapote ala North Face Jacket ala Hyper Vent Garbage Bag-inspired rain gear. Lumakad kami sa ulan hanggang sa malampasan ang mga kabahayan at nagsimulang umakyat ng bundok. 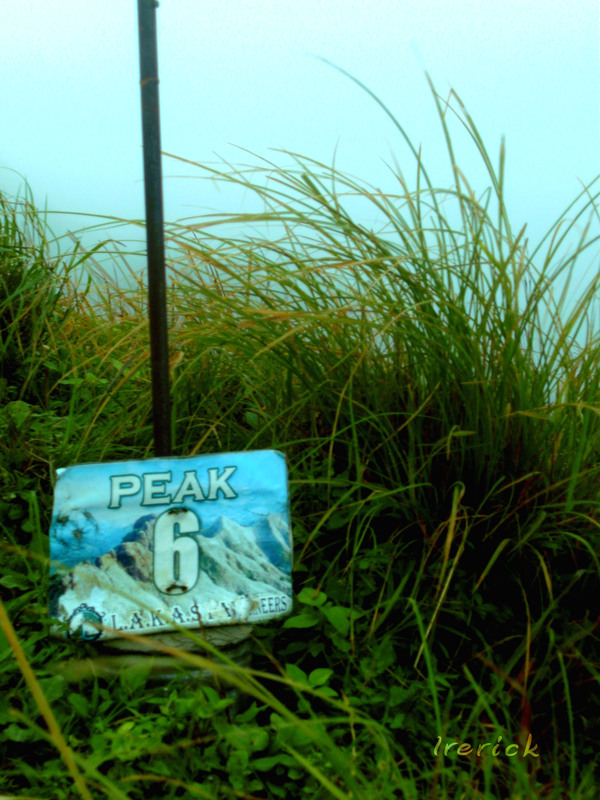 Peak 6 = Makitid na daan. Dumating kami sa isa sa mga peak. Akalain mong naka-Peak 6 na pala kami na ang sabi ni Kuya Gerry ay nasa Peak 2 pa lang kami. Makikitid ang mga daan patungo at pagkalagpas ng Peak 6. Halos isang talampakan lamang ang lapad ng bawat daan, at bangin na ang magkabilang gilid. Balanse ang pangunahin naming sandata nguni’t tila mahirap lang talagang kalaban ang putik. Samahan pa ng matatalim na talahib na humihiwa sa aming mga balat sa bawat hakbang. So ano tuloy pa ba? Nangangalahati na kami sa aming paglalakbay. Siguro ito na ang tinatawag nilang “Point of No Return”. Alas-nuwebe y medya na ng umaga nang kami ay dumating sa camp site. Doon ay kinalabit kami ng kaibigan naming ang pangalan ay ‘Gutom’. At dahil kaibigan namin siya, hindi namin siya binigo. “E adobo ate?”, ang muling tanong ni Tim. “Ayun o lumilipad pa. “, sabay turo ni ate sa buhay na manok na tumalon mula sa bakod. Sumali si Karah sa usapan, “Saan galing ‘yung manok?” Isang kuya pa ang nakisabad, “Sa itlog iha.” At mula noon, gusto nang tumira ni Karah sa bundok na ito. So ano tuloy pa ba? Tuluy na tuloy! Peak 8 = May Namatay na Rito. Nagsimula kaming lumakad muli, na nagtatawanan. 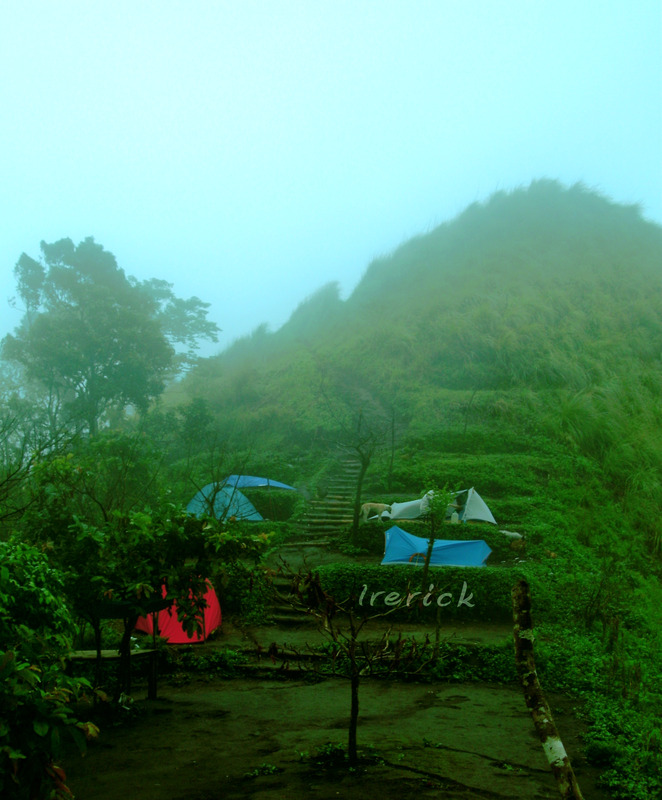 Masaya naming iniwan ang camp site at tumungo sa Peak 8. So tuloy pa ba? Oo, parang EDSA lang ‘yan. Kahit may nakasulat na ‘May namatay na rito’, tuloy pa rin sa pagtawid ang mga tao. Sa kasagsagan ng muling pag-ulan at muling pagbibigay serbisyo ng aming iba’t ibang klaseng rain gear, tila mayroong isang tinig na hindi namin narinig, or at least ni Jenny. At sa sobrang pagbabalewala namin sa maliit niyang boses na natatabunan ng tunog ng ulan, hindi na niya nakayanan at tuluyan na siyang bumitiw at humiwalay. Tila hindi na kinaya ng isa pang suwelas ng sapatos ni Jenny ang mabilis na mga pangyayari. Nangungulila na pala ito doon sa isa pang suwelas na nauna nang bumaon sa putik kaya naisipan na rin nitong humiwalay na ng tuluyan. So, Jenny, ano tuloy pa ba? “Oo tuloy pa rin! Sige lang nang sige hangga’t hindi pa medyas mismo ang sumasayad sa lupa! Kahit gaano pa katarik ‘yan!”, ang sagot niya sabay labas ng kanyang mga ngipin na puno ng halos kalalagay pa lamang na mga bakal. 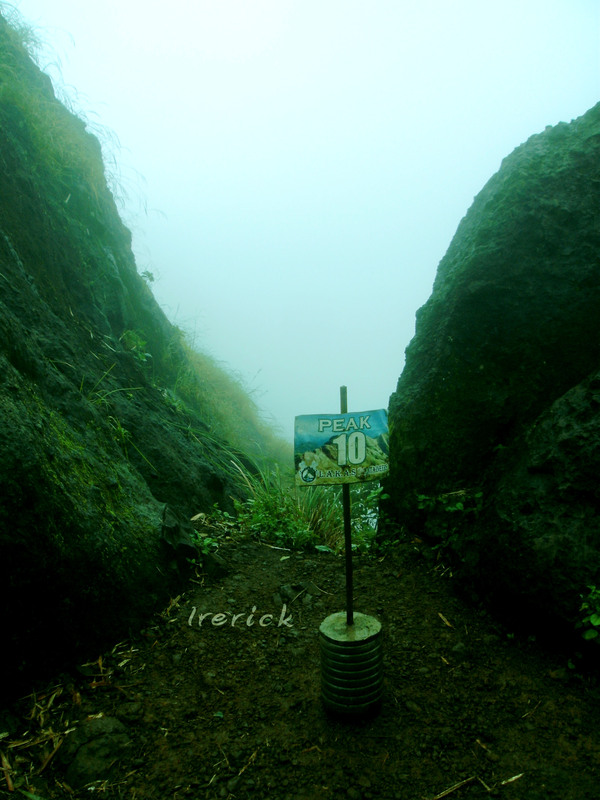 Peak 10 = Matarik na batuhan. Matarik. Oo. Mas matarik pa sa mga tawa namin sa naiwang suwelas. Dumating kami sa isang parte ng bundok na may bato. Actually, para siyang isang napakalaking bato na inilagay sa gitna ng aming daraanan patungo sa susunod na peak. Nang makita ko ito, inisip ko kung paano namin ito tatawirin. Tila nadinig ng langit ang aking tanong kaya’t daglian itong nagpadala ng biswal na demonstrasyon. Pinatabi kami ni Kuya Gerry dahil mayroon daw kaming mga kasalubong. Maya-maya lamang isang grupo ng mga kalalakihan na taga-New Manila raw ang nagpakita sa amin kung paano tawirin ang matarik na batuhan. Ang ikinamangha ko sa kanila, para silang nagwo-wall climbing na may mga bitbit na sobrang bibigat na mga gamit. Galing sila ng camping at hindi raw sila binalikan ng kanilang porter. Rock climbing? So ano tuloy pa ba? Umuulan na! Game pa rin! Kahit pa isang maling hakbang o hawak lang namin ay diretso kami sa kung saan kami nanggaling. Nang malagpasan ang malaking bato, nagsimula na ang roller coaster ride. Nagsimula na ang paulit-ulit na pagpanhik-panaog. Nagkaroon ng mga paikot na daan, patarik na patarik na mga paakyat at padulas na padulas na mga pababa. Ilang beses akong umupo muna para magpahinga; napaupo rin kahit pa inaalalayan na ni Kuya Gerry at halos paupong naglakad sa mga sobrang taas na parte. Nagsimula na rin akong hingalin. Siguro nagiging manipis na rin ang hangin. Laking pasasalamat ko na hindi sumama kay kaibigang “Gutom” ang childhood friend kong si “Hika”. Laking pasalamat ko din na nag-jogging ako sa UP noong nakaraang araw, na doon yata muna siya tumambay matapos ang halos isang oras na pag-ikot sa Academic Oval. So ano tuloy pa ba? Huwag lang makakahalata si “Hika” na hindi ko pala siya isinama. 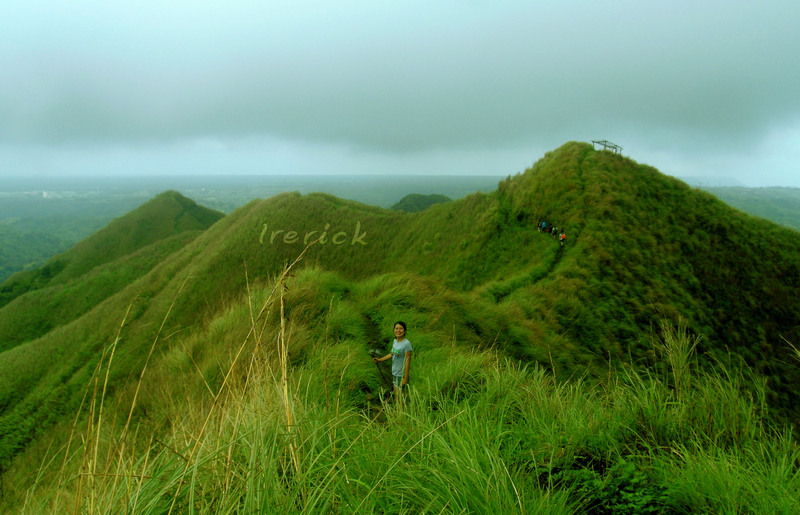 Peak 12 = Mababang temperatura. Malakas na Hangin. Sa patuloy na paglalakad, patuloy ang paglalakbay patungo sa kalangitan, patuloy ang pagbaba ng temperatura, patuloy ang pag-ihip ng malakas na hangin at patuloy ang pagkapal ng hamog. Nagsimula na ring mahawahan ng hamog ang aking mga salamin, na noong tinanggal ko ito, mas malinaw pa ang aking paningin. Nguni’t ang aking mga mata ay kalahating bulag kapag wala ang aking mga salamin. So ano tuloy pa ba? Ang hika, kapag dumating, konting pahinga lang wala na ‘yan. Pero iyong wala na akong makita, hindi ko tiyak kung ang nasa tagiliran ko ay isang talahib lamang o isang bangin na pala, medyo parang ibang usapan na ito. Nguni’t konti na lamang, tuluy na tuloy na ito. 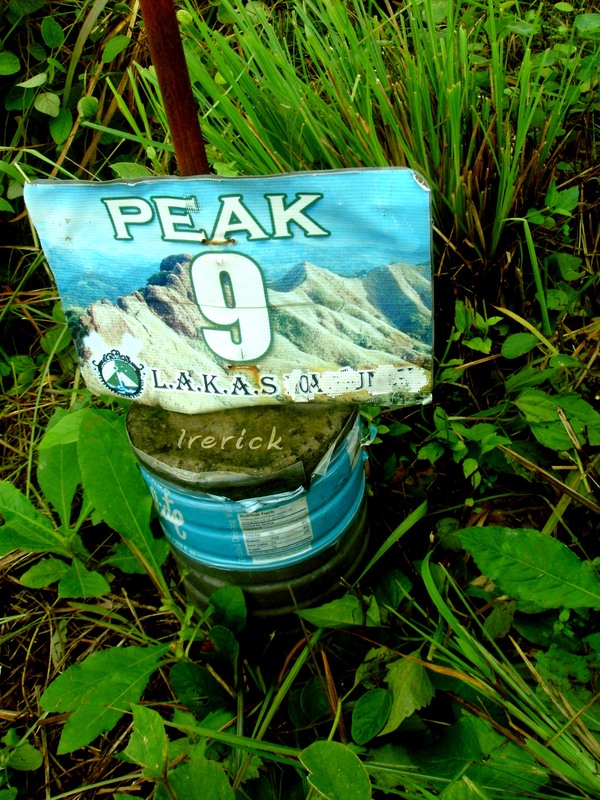 Peak 13 = Tuktok ng Batulao. Matapos ang halos apat na oras na pag-akyat, narating rin namin ang inaasam-asam na summit. Nguni’t hindi ko man nakita na nasa summit nga kami, iba pa rin ang pakiramdam. May dumating na bagong kasama, ang kaibigan kong si “Pagod”. Talagang iniupo niya ako sa isang bato, itinikom ang aking mga labi at ipinikit ang aking mga mata. Dumating ang napakalakas na hanging dumampi sa aking pisngi. Maya-maya lamang ay narinig ko ang napakalamig niyang tinig. May ibinulong siya sa akin, na tila Extra Joss ang epekto sa aking katawan at nag-udyok na tapusin na ang second half ng aming paglalakbay: ang pagbaba. Ano ang ibinulong niya sa akin? “Congratulations. You made it.” Oo, nakaya ko. Nakaya kong sagutin ng “Oo” ang lahat ng “So ano tuloy pa ba?” na aking tinatanong sa simula pa lamang. Nakaya kong sumagot ng “Oo” kahit sinasabi sa akin ng mga sirkumstansya na “hindi, huwag na lang kaya”. Nakaya ko at nagawa ko, nagawa namin, na makarating sa summit, dahil sinubukan namin. Nakarating kami kahit tila “against all odds” ang scenario. Oo, nagawa namin… dahil sumuong kami. At sa aming pagbaba mula sa summit, sinalubong kami ng ilaw mula sa pagsilip ng araw na siyang naging daan upang makita namin ang magagandang bato ng bundok Batulao na noong una ay natatakpan ng hamog.